As I've shared earlier, I switched to a grade 4/5 class this year, and with the grade change, came a room change. 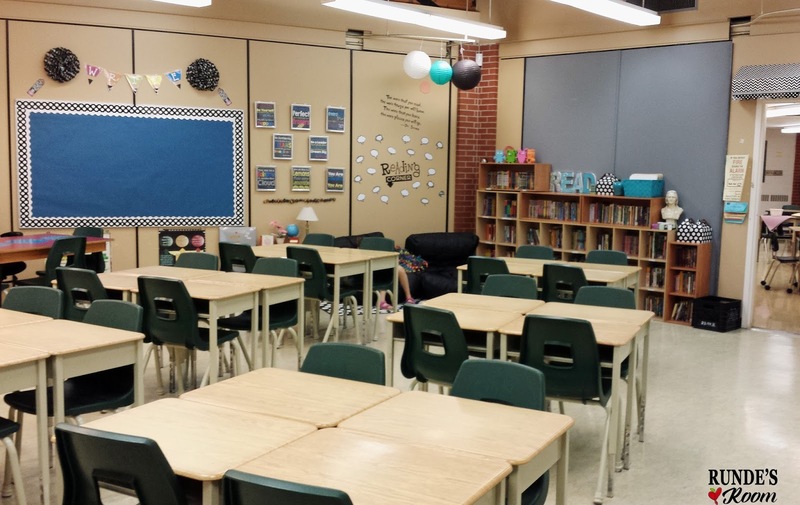 This was my first room change in 12 years - I had changed grades before, but kept the same classroom. 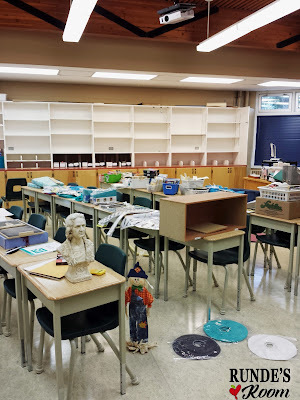 It wasn't a big move - literally next door, but with 12 years of junk valuable teaching materials crammed into every corner and cupboard in my old room, it certainly felt like a big move to me. 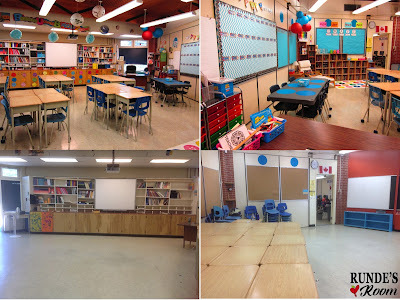 This picture shows what my old classroom looked like cleaned out at the end of the year. After a day or two of working on my own, I decided to bring in the troops (my girls) to help me finish the job - sometimes they were a big help, and sometimes I questioned my decision repeatedly. haha. But, somehow, it all got finished. I decided to change up my colour scheme a bit - leaving behind the deep red and bringing in some fun black and white polka dots (most of my decor was purchased from SchoolGirl Style). 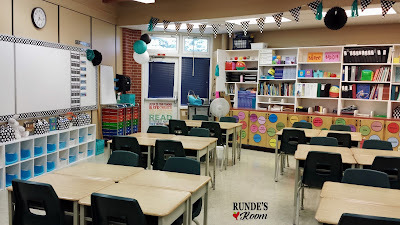 I kept my teal and turquoise accents because they went so well with the black. I have a lot of empty wall space still - I'm waiting on some bulletin boards to be installed, and I like to fill the classroom with student work, but it's getting there. 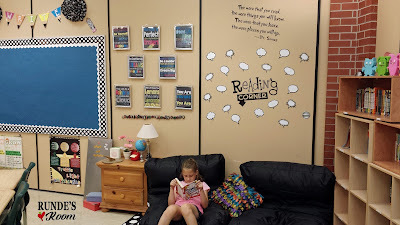 This is my reading area - my books are organized by genre / author / series in the cubbies. The area above the bookshelves is one of the areas where I'm still waiting for bulletin boards (this is where my reading, writing, and math goals will go from my Building Better Responses resource). 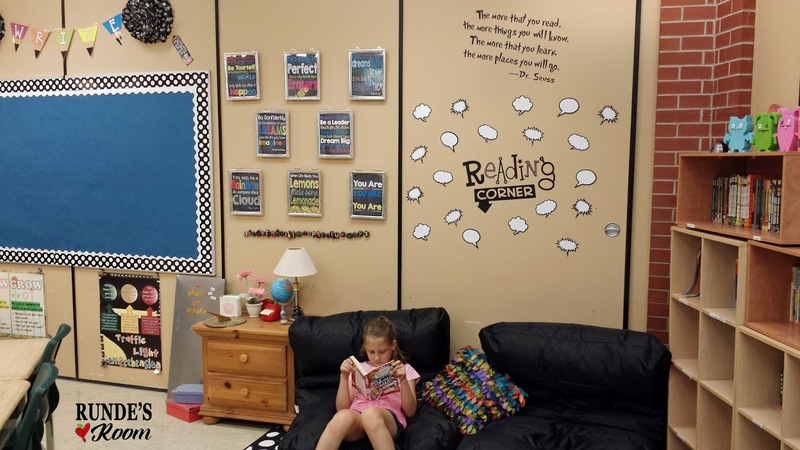 I do love this happy little corner - and since my girls were happy to curl up in a bean bag chair and grab a good book, it must be kid-approved, too. This is my desk area - I can't quite give up my desk yet. Behind my desk is my tech area - printer, document camera, laptop, laminator, etc. And I was super excited that there were already little hooks there perfect for hanging my question fans. The little table beside my desk is for working with small groups - I've been wanting a kidney table for ages, but I haven't been lucky enough to get one yet. 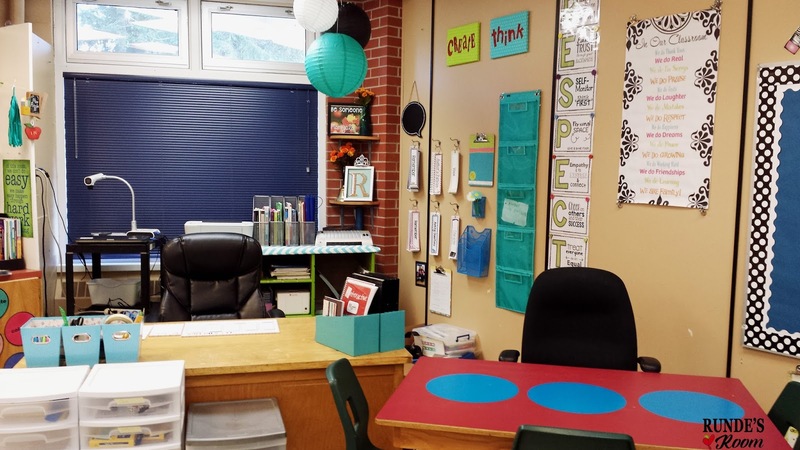 The polka dots on the table are vinyl circles - which students can write on with dry-erase markers during our small groups. My back wall. That big bulletin board (my ONLY bulletin board at the moment) will be my writing board - students will update it weekly with samples of their work, becoming an interactive writing portfolio for them. My very large white board area. 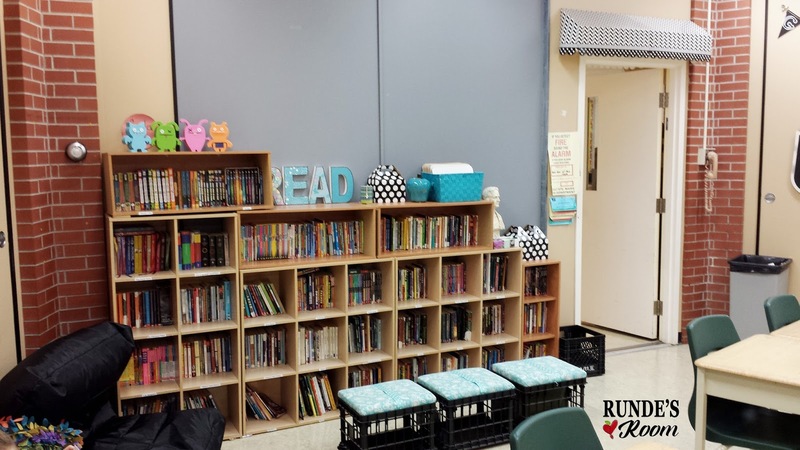 I went out and purchased these cubby bookshelves for under the whiteboard because it just needed something there. The baskets in the cubbies will be for student supplies (you know, all those extras they can't quite fit in their desks) and I did enjoy decorating the top of the shelves - some beautiful hard cover books with stuffed animals that go along with the books, some cute boxes I have manipulatives stored in, and a few flowers. The rainbow drawers house tons and tons of student supplies - everything they need to get them (and me) through the day. 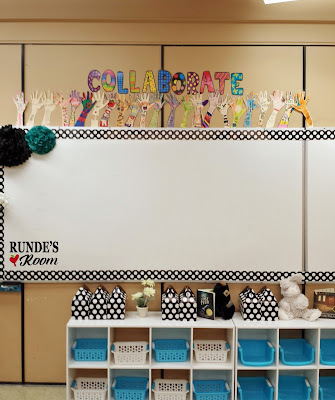 I didn't wait for long to begin to decorate the area above the board. On the first day we made "All About Me Hands" where the students traced their hands and filled the inside with their name and some of their favourite things, then I put the letters COLLABORATE above the hands because collaboration is so important in our classroom. And, that's about that. 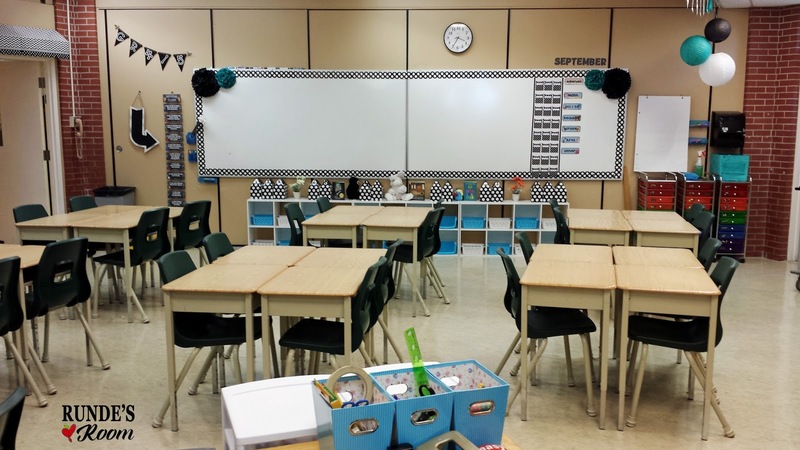 Not quite as colourful nor as full as my previous classroom. But that's OK. 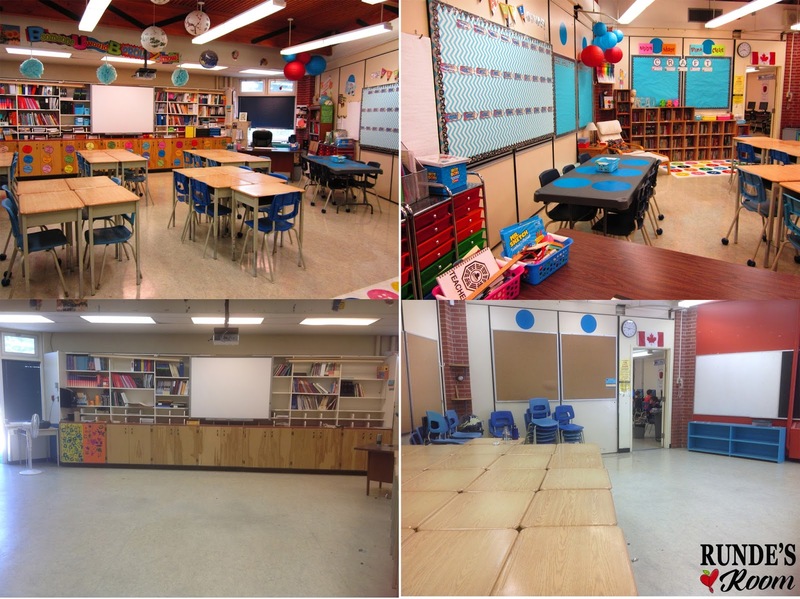 I can't wait to see it evolve this year as it becomes a lively place full of learning and growth and engagement. I'm pretty sure it won't be long before I love it just as much as my other room. 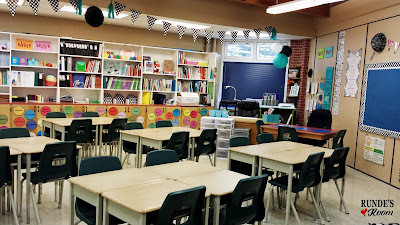 I personally love a simple classroom with not as many colours... I know some kids appreciate it too as having too much going on can be distracting. 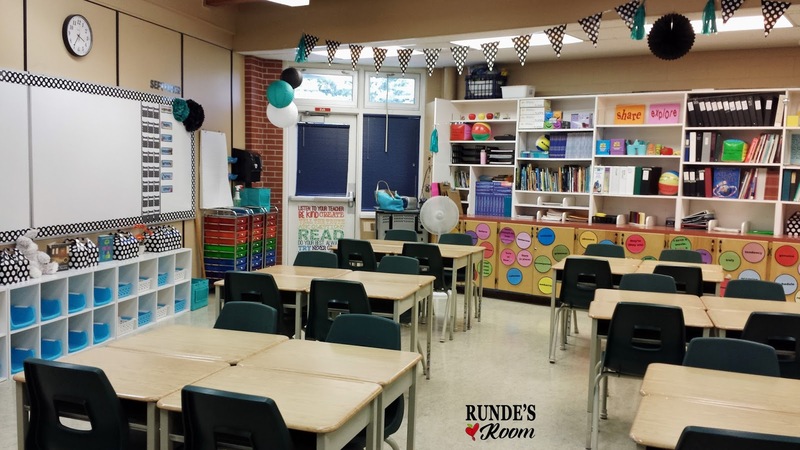 The room looks great (but my last classroom was also a turquoise/black/grey/white theme). Thanks for you post. It's always insightful to see other teacher's classroom. Kudos to you for changing grade levels and teaching a combo class. 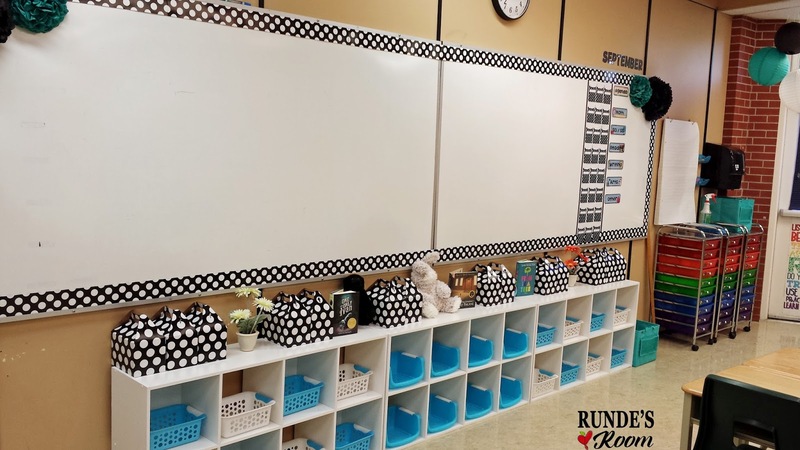 I think the shelves under the whiteboard are perfect!